Before its release last Friday, Maniac was billed as Netflix’s latest, mysterious stab at prestige television-making. By all accounts, the series allows director Cary Fukunaga (True Detective) and creator Patrick Somerville (The Leftovers) to demonstrate their mastery of world-building—multiple worlds, in fact—over the course of 10 episodes. Maniac takes place in Manhattan, in a not-so-distant future where people can rent friends and pay for subway rides and dinner by listening to a person read ads out loud. The set design is meticulous and polished, the characters are realistic and memorable, and the premise—that in this fictional land of despondency and disillusionment, a miracle drug can zap your traumas and “fix” your mind—is certainly enticing. But while Maniac has all the components of a compelling series, the concept, often exhausting, suffers under a bloat of ideas—signs, catchphrases, and even animals (Hill turns into a hawk at one point) can take on double meaning or no meaning at all. The stunning visual elements and excellent acting can’t save the show from its central problem: It stretches a simple idea about a relatable fear (that we will never truly be okay) into something meaningless and dull. It stretches a simple idea about a relatable fear (that we will never truly be okay) into something meaningless and dull. 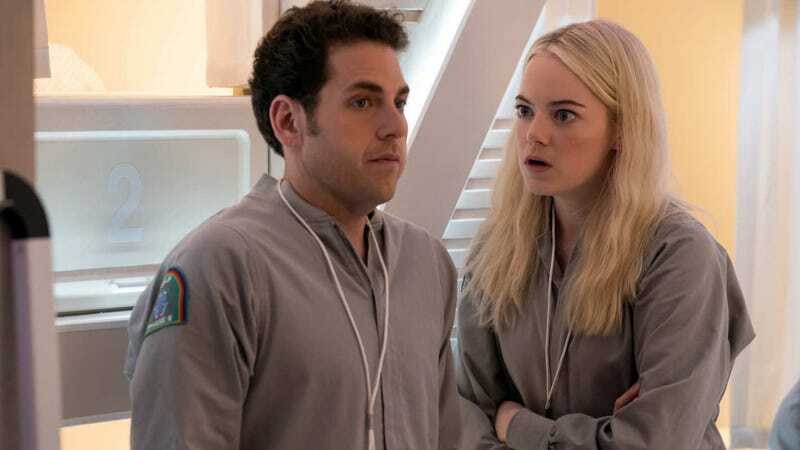 Watching Maniac feels like waiting too long for the big reveal, and nowhere is this more apparent than in its main characters’ experimentations. We first see Owen Milgrim (Jonah Hill) and Annie Landbergh (Emma Stone) separately enter the same controversial drug trial, which was originally conceived by Dr. James Mantleray (Justin Theroux in the worst wig I’ve ever seen). The trial aims to eliminate human suffering and the need for talk therapy by changing patients’ brains on such a fundamental level that whatever ails them vanishes overnight. They both join for different reasons: Annie enters the trial because she’s been abusing one of the three drugs used in it—the one that makes you relive the worst moment of your life. Owen, who had an episode of delusional psychosis 10 years ago, has been seeing visions again and follows the signs that tell him to sign up. Once they start the trial, they keep appearing in each others’ dreams, whether it’s in a Lord of the Rings landscape or a small town in Long Island. That cross-contamination of thoughts could mess with the experiment, run by Dr. Azumi Fujita (the seriously wonderful Sonoya Mizuno), who has enough trouble on her hands, dealing with a humanized computer that’s become depressed. The characters and the viewer understand that there’s some bigger significance to Annie and Owen’s connection, even if it never turns romantic—one of the movie’s more refreshing aspects. But for much of the series, it’s unclear what exactly that connection means. Their interactions raise questions about what it is to be human, to suffer, to have free will, and what we should do with the memories that follow us—the type of meditations that compel you to keep watching to find meaning. But Maniac doesn’t do a good enough job of connecting the dots to make that process fun. The show instead wallows in its themes, indulges in tangents, and buries the payoff in murky symbolism. In the pharmaceutical trial, the patients are suspended into virtual worlds that are dream-like sequences meant to reveal unique insight to them. The act of watching these episodes can feel like a dream itself. The one where you wake up from the dream and think it all makes sense, only to realize it doesn’t. the series feels more concerned with propping up the elaborate concept... than exploring all of the idiosyncrasies and interpersonal relationships between its characters. These and other moments are entertaining, but they are few and far between. It doesn’t make trudging through the long dream sequences (which can take up full episodes) worth it. There are moments that feel brilliant because of the performances, but then leave me wanting more. Hill creates a nuanced portrait of mental illness and guilt in Owen, but then plays different (sometimes very funny) people in Owen’s dreams. Stone proves she can play the flawed but scrappy young woman/reluctant heroine again, as she did in Birdman and La La Land. And Mizuno is great as the steely, ambitious, and unintentionally hilarious Dr. Fujita, who loves to smoke indoors and cares about the mission of the drug trial above all else. Still, the series feels more concerned with propping up the elaborate concept—that the world is full of signs, not all reliable; that reality may not be what it seems; that our identities are malleable up until the point that they are not—than exploring all of the idiosyncrasies and interpersonal relationships between its characters. Maniac seems more concerned with being great than being arresting, relatable, or funny. Its inflated sense of purpose is clear from the beginning, and it’s hard to let the actors’ goodness raise to the forefront while sitting in that smog of importance. Maniac is all about questioning our perceptions of reality, our constructions of ourselves, and our assumptions of what’s normal. However, the ending is rooted firmly in this world, in the real world; and it reaffirms something we should have picked up on along the way about the power of human connection and the road to recovery. It’s a shame we only spend the last few minutes on that valuable lesson—one of the few I was able to enjoy. Maniac is currently available to stream on Netflix.